Making Faces! Is now available as a self-study online class. In Making Faces we will draw, paint, collage, make interesting combinations and have as much fun as possible as we playfully explore the many artful possibilities with this fascinating subject matter, the face! Six lessons and a vibrant online community! Join in! BIG BOLD BLOOM WILD PAINTING! is now available as a self-study online class. BIG BOLD BLOOM 2! is now available as a self-study online class. Would you enjoy going big, loose and free with your paintings? Do you love color and line work? Join me for a 5 week, 10 lesson online class where we will work in layers as we play with color, design, drawing, push and pull (background and foreground) and more! And we will use beautiful flowers as our muse! For more information on Big Bold Bloom Wild Painting click here! For more information on Big Bold Bloom 2 click here! WORD PLAY PAINTING is available as a self-study online class, sign up now! Joy of Collage online class is available as a self study sign up now! I LOVE COLLAGE!! This class is filled with all of my very favorite techniques, lots of encouragement, projects, and a supportive & fun online community. This Online Class has full focus on creating collage! Lots of gluing, layering, storytelling tips, as well as the extra ways I like to bring a piece to a finish…We talk about design and shape making and ways to set things back and pull them forward….there are wonderful steps that i share to help make your collages sing! This class is 6 lessons and is available anytime for you to enjoy at your own pace. We have a lovely online community for Joy of Collage that is kind and helpful and vibrant! Join us anytime! We would love to have you! Click on the image for more details! 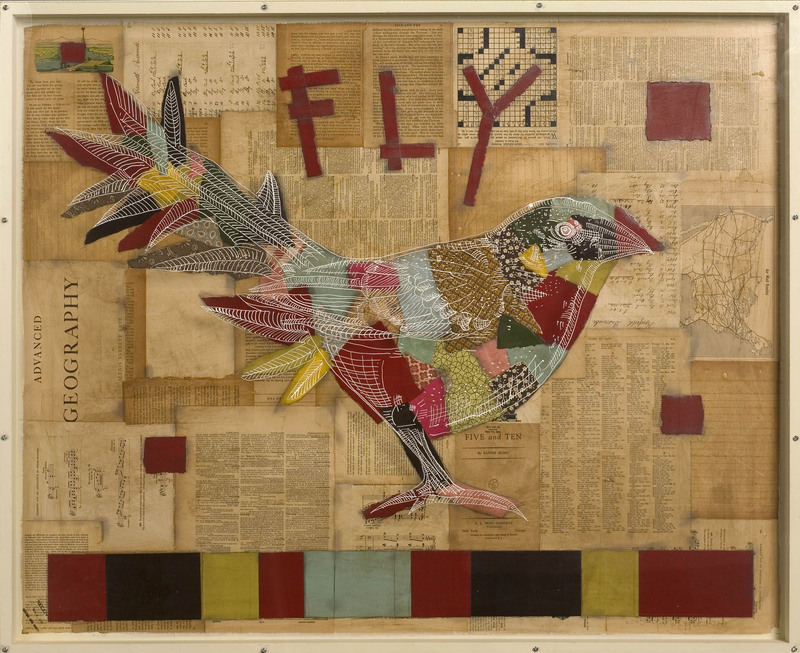 The Joy of Mixed Media Assemblage Online Workshop is available as a self study. Are you interested in found objects and assemblage? This is a great workshop to learn about and play with collage, altered images, altered pieces and parts, drawing, painting and combining things in a fresh way. And you get use all those great things you have collected over the years! There are so many wonderful things that happen when you take an Online Workshop…of course you get to move your hands, but you also have a great private online community filled with like minded and encouraging folks to share with, show your progress (if you like), and be inspired by! I love this part of an online workshop and enjoy checking on your progress and cheering you on! Plus you can even make art while sipping coffee in your jammies! This class begins on October 27th, 2014 and will be Monday, Wednesday, Friday for 2 weeks! You can work at your own pace at any time and enjoy the content for a full year! Please join us! Click on the image for more details! Please add me to your list for upcoming workshops. I need to get back into the creative groove and have been “blocked” for along time. You and I graduated WPHS together in 1977. Have many pieces of your Mom’s work! Shelly! HI!!!! How nice to hear from you!! It would be my pleasure to keep you in the loop for future workshops. Your creativity is always there, sometimes it just needs a little nudge, and a fun place to come out and play. We have had so many “ah ha” moments, breakthroughs and full on epiphanies during workshop. I just love that part, and the fantastic way it ripples through and inspires the entire group! You never know! My niece is moving to the UK, and If I could get a nice group together, I would surly love to visit! Thanks for asking and I will keep you posted! if you do, i’m coming. It would be so great to have you play with us at the workshops in Ann Arbor! I know you will absolutely LOVE the shop FOUND and the wonderful ladies who make it as special as it is. I am so glad you likey!! I will keep you posted! Hi!!! Do you ever come to or near Asheville, NC??? I would love to take a workshop with you! Put me on your email list, please! If you know of any places I might teach, or great spaces to contact, I am looking to travel and do workshops more often. Planning a January workshop in Chattanooga as we speak! hi, I do not know of a place exactly IN Asheville, but you could contact Jane at Random Arts in Saluda, NC. That is about 45 minutes south of Asheville on I-26. Google “Random Arts Saluda, NC” and it should come up. She has workshops going pretty much year round. Michael De Meng comes there and teaches each spring. Best wishes! Lynn (my name too) in Asheville. You! Thank you! We are so glad you enjoyed it! It was a pure pleasure for us and went so quickly. It was one of those really great experiences where you don’t want it to end. I LOVED what you did. Fantastic work!! You are super talented. We are already talking to Mary about coming again next summer. Thanks for your good wishes for the fair, it’s going really well so far! and a few earrings of Marty’s to add to my collection. Looking forward to spending time with your creative family. LOVE the little girl U-Tube. YAYAAAAY!! that is all wonderful stuff!! Thanks! We will see you in January! looks as if you are taking a loooooooong vacation. for you to come to Minneapolis, then I wouldn’t have to go anywhere at all and I could even offer you dinner! Let me know and thank you for all your lovely blog entries! Thank you! And yes! We are heading up to Ann Arbor for a show in July and we will be teaching a workshop in Kerry Town at the most wonderful store ever, called FOUND. We taught there last year and it was amazing! More info to come!! I am a big fan of your work. Any chance of you doing a workshop here in Central Florida? I have a great idea for a new workshop. I have been so inspired by painting outside and learning a new medium. I want to bring that excitement to the next creativity workshop! I think it will be October, in my studio space at McRae. Mixed media and more! Hi Lynn – are you planning any workshops for 2012? I missed the one you did in Atlanta @ Paula Joerling’s and really want to get to do one for next year. Please add me to you email list for workshops, if you have one – thanks! Will do! Now that show season is over, it’s time to look towards new workshops. I’ll keep you posted. And thank you! Dear Lynn, Love your work in Masters Collage. Please add me also to the email list for upcoming workshops. Thanks! and have an excellent day! Oh- how I wish I could make it all the way to you, Lynn! It´s on my priority list this year- until this miracle actually happens- I´m wondering- since Misty Mawn, Katie Kendrick and a lot of other women has their classes on a dvd- or online- is it maybe something you´d like to consider- I know I´d LOVE to pay some houndreds of dollars to take your class- several times over- like every week all year LONG!!! I´d LOVE to be your student from Stockholm- don´t know if it´s technically possible- but since you are such a great photographer- not to mention Mrs. EXCELLENCIA in art- and has a charm like few others- well- I just want to sign up right here- right NOW!!! I am very interested in attending a workshop of yours this year. I live near Winter Park & have a sister in Ann Arbors so would love to go either way. Please keep me posted on your schedule. Thank you. Thank you Carla! I love your finger paintings!!! I absolutely LOVE your work. I just want to play like you do. I’ll be in Florida January, February, March. Any chance you would be doing a workshop during that time? I know you live in Winter Park where 2 of my kids went to school. I live on the west coast and paint at The Beach Art Center in Indian Rocks. Your new book- Expresive Flower painting is such a treasure- exactly what I want to do! You are so wonderful Carol!! I am so glad you are enjoying the book 🙂 I may be having a Big Bold Bloom workshop in the spring in Safety Harbor, FL 🌺🌸🌻 Still working on dates. It would be great to have you join us!